Brussels sprouts...love them or hate them? I happen to love them but only when they are prepared properly: crispy on the outside, tender, but not overcooked on the inside. The latest combination of flavors, and a new technique of preparing these beauties, comes courtesy of Gina aka SkinnyTaste. Magically, I happened to have all four ingredients (or their cousins) on hand to make a version of her Buffalo Brussels Sprouts with Crumbled Blue Cheese. I liked Gina's method of first searing and cooking Brussels sprouts on top of the stove and then finishing them in the oven. You could, however, do the same technique in the oven by first searing the halved Brussels sprouts on a cookie sheet for about 5 minutes cut side down and then continuing to roast these shaking the pan occasionally. I did not have Franks Hot Sauce and used sriracha instead. For the blue cheese, I used Roquefort Society Bee variety. So good. 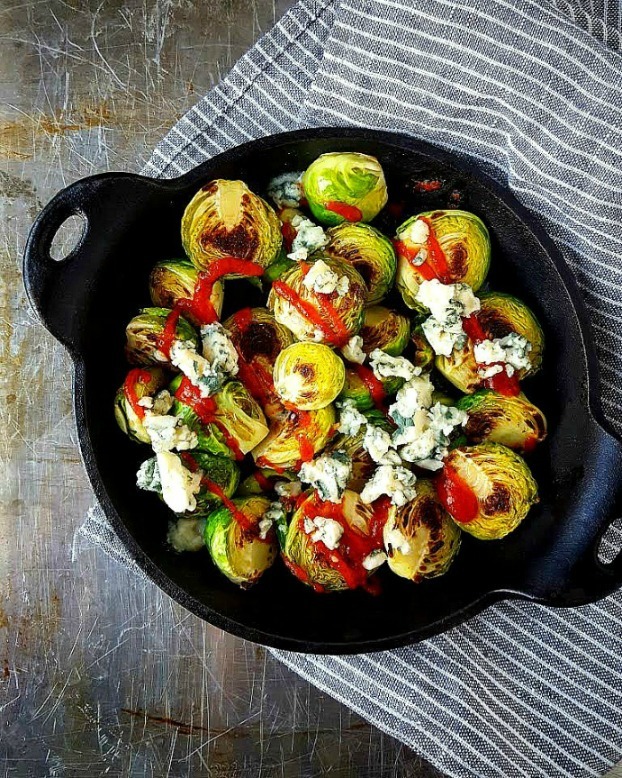 All you have to do is top the roasted Brussels sprouts with sriracha and crumbled cheese right before serving. Yes, I ate the entire mini skillet worth of Brussels sprouts for lunch. How do you like eating Brussels sprouts?